Following its outbreak in 2010, the Haitian cholera epidemic has killed 8,694 persons, sickened an additional 744,147 victims, and continues to ravage the Haitian population as international funding for cholera treatment programs diminished. Fortunately, the Government of Haiti announced a 10-year, $2.2 billion Cholera Elimination Plan to combat this national crisis. 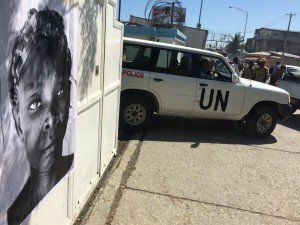 Acknowledging that the United Nations Stabilization Mission in Haiti (MINUSTAH) most likely introduced this epidemic, the HAWG calls on the United Nations to fund and implement the Cholera Elimination Plan. Adequate water and sanitation systems remain a key development challenge in Haiti, and the HAWG supports efforts to improve and sustain this critical infrastructure. Faith leaders to Obama: Take Action on Cholera! Last week, Representative Frederica Wilson issued a statement in response to the New York Times article that announced the UN’s acknowledgement of its role in Haiti’s cholera outbreak. Along this arid strip of borderland, the river brings life. Its languid waters are used to cook the food, quench the thirst and bathe the bodies of thousands of Haitian migrants who have poured onto its banks from the Dominican Republic, fleeing threats of violence and deportation.